Dr. Sean Fredenburg serves as the Instructor of Saxophone at Portland State University where he teaches applied saxophone, chamber music, and woodwind techniques. He is dedicated to promoting new music works from many bright young composers. Outside of the university setting, he is the saxophone chamber music coach for the Portland Youth Wind Ensemble, appears as artist faculty at Woodwinds at Wallowa Lake, and is instructor of saxophone and world music at Blue Lake Fine Arts Camp. Sean holds degrees from Louisiana State University, the University of North Carolina at Greensboro, and a Doctorate of Musical Arts degree from the University of Oregon. His primary teachers have been Griffin Campbell, Steven Stusek, and Idit Shner. 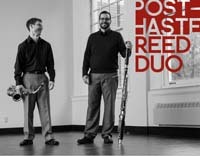 Based in Portland, OR, the Post-Haste Reed Duo (Sean Fredenburg, saxophones; Javier Rodriguez, bassoon) has toured colleges and universities throughout the United States, performing and presenting master classes in woodwind performance, chamber music, and entrepreneurship. Additionally, they have appeared at numerous national and international conferences including the College Music Society, International Double Reed Society, North American Saxophone Alliance, the Society for Electro Acoustic Music in the United States and the Hawaii International Conference on Arts & the Humanities. Post-Haste has been featured artists at the Jubilus Festival in Gainesville, FL, White Lake Chamber Music Festival in White Lake, MI, Friends of Rain New Music Ensemble of Portland, OR, Future Music Oregon in Eugene, OR, and has served as Ensemble-In-Residence for Classical Revolution PDX’s inaugural Outreach Series Program. Post-Haste Reed Duo’s debut studio album Beneath a Canopy of Angels…a River of Stars was released on the Aerocade Music label in 2016. Javier Rodriguez Bassoon Dr. Javier Rodriguez is the Assistant Professor of Bassoon at the Lionel Hampton School of Music at . . .